The Eels Family: [Article] Jang Keun Suk, starting his tour around 8 cities in Japan……stimulating fans’ sensibility. [Article] Jang Keun Suk, starting his tour around 8 cities in Japan……stimulating fans’ sensibility. [OSEN=Pyo Jae Min] An actor Jang Keun Suk is starting his tour around 8 cities in Japan. He is going to begin his big run with holding a concert on March 14th in Osaka. This tour is going to hold total 16 performances, 12 hall performances in 6 cities (Osaka, Niigata, Fukuoka, Okayama, Shizuoka, Hokkaido), and 4 Arena Tours in two cities (Kobe, Tokyo). Lots of attention is gathered around Jang Keun Suk’s tour in Japan as selling out all tickets for the Hall performances already. ‘CRI SHOW3’ is a third tour he is holding which is a continuation of last two tours in 2011 and 2012. This tour is getting more attention than the last two tour because via this tour Jang Keun Suk is revealing tracks in his third Japan original full album ‘monochrom’ for the very first time. For this tour he is attracting the public attention by giving notice on awakening viewers’ emotion and visual cues. Jang Keun Suk will keep his promise by creating stages that highlights “classical” emotions wearing costumes made out of mesh materials and using projector instead of using equipment like wires, lifts, and fancy visuals using LED which used for his previous tours. 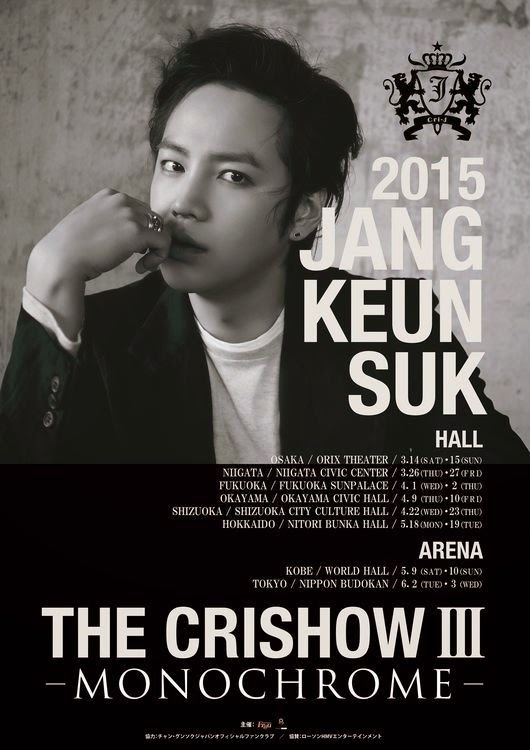 Above all, Jang Keun Suk is arising the level of fans expectation towards this tour by treating his fans with the deeper and professional performances via music-centered stage that is different from last ‘CRI SHOW 1,2’ which included many aspects of musical theatre focusing on story telling. A person working for Jang Keun Suk said “we are in the modern period, yet Jang Keun Suk included “classical” emotion in this tour. Jang Keun Suk is also going to intimately communicate with fans via approaching fan in the true and genuine manner.